So.. I found a really great pic on flickr of Ry-Ry and want to make it my avatar... why, when I upload it does it stay tiny? I looked at the image stats on my computer and, when saved as a .gif a smaller version of the image is below the 97.7KB limit... does it still have to be smaller than 110x110 pixels in that case? Is that why my icon stays small? Your icon size limit should grow based on your post count, so the pixel size limit is probably the culprit. Rob should be able to give a better response, so stay tuned. When the board was created, we decided to use bigger avatars as an incentive to post. So as you post more, you will be able to have a larger avatar. You will be there in no time. Thanks for your help guys - certainly an incentive! May I just say, Ryan looks absolutely astonishing in that picture. 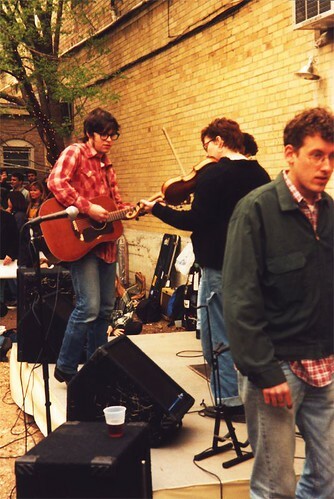 Whiskeytown era, right? He looks like a hot version of John Fogerty. He looks GREAT, I love that picture. Just found it on flickr when searching for Whiskeytown-era pics... Here's a link to the image set - http://flickr.com/photos/rustedrobot...7594112238878/ there are a few more Ry-related snaps! I love that picture - thanks. I try not to think about those days any more. It just makes the present seem so much worse. Sideburns like that is my greatest ambition. Another avatar query - I used a gif for mine but it won't move, it just shows like a normal image. Why does Jack's move and mine doesn't? Hmm...I'm not sure. Did you use a web link or upload the image from your computer? I've tried both, it never works. Yeah I tried both ways too. I've tried in the past and it's never worked. Except the one time when I used Jack's avatar for a day. For some reason that one worked.